A/C was on a combat operation when gunner was hit by hostile ground fire. A/C was on a recon mission with Cobra gunship when it was struck with .51 cal AA fire causing a fire onboard. The fire was extinguished but the cargo became unstrapped. CE was attempting to restrap cargo when he was hit by .51 cal round which entered his lower back and exited the side of his head. A/C crashed into side of mountain during the day while attempting to pickup a patient after delivering a spare part to Camp Evans. A search was conducted about midday, but took a lot of ground fire and the A/C was found the next day. A/C was flying over DaNang Bay to the north when they spotted a destroyer, flew alongside port side of ship and made a cyclic climb to approx 200', executed sharp left turn into a power dive parallel to starboard side of ship. A/C failed to recover from steep dive, impacted water, exploded and burned. Shot in left temple while returning from the AO. *Flynn died 17DEC70 of injuries. Killed at Bikini beach when a 2.75" FFAR was accidentally fired and exploded near the A/C he was working on. A/C flew into a mountain in inclement weather, flying a night flare mission for a Shark scramble. A/C left Chu Lai West AAF enroute to Admin Pad for Night Hawk Mission. After picking up mission sheets, A/C proceeded on normal takeoff and was at approx 200' when a loud bang was heard, followed by what appeared to be an explosion. A/C yawed left and power was lost. A/C landed hard, collapsing skids and sliding approx 15m. P was sustained fatal head injuries from one of the M/R blades. Killed by shot through windshield. A/C crashed during training flight at Quang Tri Airfield. Witnesses heard popping noise on final, lost tailboom, crashed and burst into flames. A/C was one of 8 acft in support of 5th ARVN Div, located W of Tam Ky. While approaching alternate airfield, A/C was flaring for landing, A/C began to vibrate and tail slid right. A/C continued to slide right in a hover. Tail suddenly swung left. Application of left pedal had no effect. Pilot rolled off throttle and settled to ground in left tail-low attitude. Left skid collapsed and tailboom severed. A fire started in the aft section of the fuselage. Crew exited and pilot was struck by rotor blade. Was wounded by a sniper while off loading resupply to a 1/52 unit N of FSB Stinson. Survived the bullet wound to his jaw but died later in the night of possible blod clot. A/C was on a flood rescue mission when it was hit by enemy ground fire and crashed. Hit tree on night Fire Fly mission, crashed and burned. Low-level mid-air collision with OH-6A #69-16023 approx 10-15 km SW of Chu Lai after picking up wounded. Acft was under the control of the 54 MED. 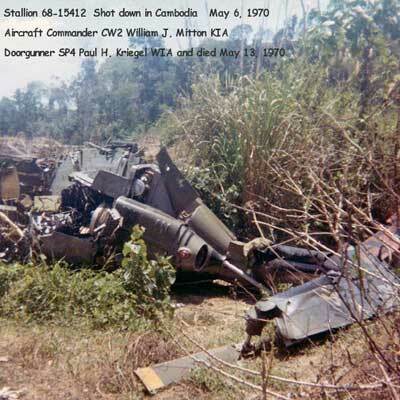 Accidentally shot when M-60 in cargo area discharged while preparing to move a downed Huey crew from Hill 422 to Chu Lai. While at an altitude of 200' and 40 KIAS, the A/C entered IFR, losing sight of the ground. The pilot radioed Dustoff Control of his situation and his intention to return to base and entered a left turn. While in the turn the A/C struck water, broke apart, and sank. A/C crashed during IFR training flight that flew into hvy weather. Pilot radioed last position as on the 090 deg magnetic bearing off the Evans Radio Beacon at approx 2045 hrs. A/C was found next day 2.5nm N of Hue in a rice paddy, impacting the ground inverted in 3' of water and exploded. A/C was searching for another medevac (UH-1 #69-15297) and crashed while trying to operate at very low altitude and in extremely adverse weather conditions. A/C was lead acft of 2-ship mission enroute to Red Beach, flying low-level along the beach with trail 1/2m behind. At approx 30 mi ESE of Phu Bai both acft encountered heavy rain showers. A/C was attempting 180 deg left turn over the ocean when it crashed and sank. A/C was in left echelon on the flight lead. During the checks, #68-15648 accelerated forward and drifted right, impacting the lead A/C's tailboom. Both A/C departed controlled flight and disappeared into the clouds, impacting the ground about 250 meters apart. A/C accelerated forward and drifted right, impacting the lead A/C's (68-16123) tailboom. Both A/C departed controlled flight and disappeared into the clouds, impacting the ground about 250 meters apart. While taxiing M/R blades collided with another, flexing the blades and striking medic. A/C crashed during a low level Ranger team insertion near the DMZ. Suspected that a .51 caliber round came through the windshield just before A/C hit the ground at 100 knots. A/C shot down and crashed. A/C was attempting to establish communications with a lost recon team manuevering under hazardous, night-flying conditions and flying low-level to avoid foul weather over difficult terrain. While making a turn, the A/C smashed into the ground instantly killing all on board. A/C shot down by small arms in LZ. While crawling away, pilot lifted head to look and got hit in the head flipping him over. Rest of crew got out. A/C was involved in a Ranger team insertion. As the A/C settled into the LZ it was hit repeatedly in the forward section by 12.7mm AA machinegun and RPG fire. A/C was shot down during a troop insertion. A/C was on a CA supporting ARVN troops and were departing a hot LZ when it was hit by an RPG at an altitude of about 200', exploded, and crashed. A/C was low-level and passed over LZ and made a sharp left turn, M/R blade struck the ground 4 times on a slight rise in the ground. A/C rolled inverted and contacted ground rotor head first, slid approx. 85' separating the xmsn from fuselage and engine. AC and pilot were thrown out in their seats and gunner and CE remained in A/C and PAX was thrown out. No post crash fire. After A/C was shot down, pilot was decapitated by M/R blades exiting the A/C. Low leveling down a river, tailboom struck sandbar while avoiding a fishing tower. A/C was on a recon team extraction mission. A/C hovered 50' over the PZ and dropped the ladder from the right side of the A/C. Five of the team members climbed onto the ladder, and the A/C began to lift off. At about 100', A/C began to receive small arms fire and crashed. A/C was on a SF insertion mission on Tri-Borders near the Rock Pile when G was shot in the head by ground fire. A/C on a classified "Prairie Fire" operation in the lower panhandle area of Laos. A/C crashed due to engine failure. Crashed in perimeter minefield at Bao Loc returning from Dalat w/load of beer, inertia reel failed, head went through window. A/C shot down and burned during combat assault outside of Bu Dop. *Barritt died 14AUG70 of injuries. **CPT Walker was a PAX on C&C ship and was assisting extraction of crew when rocket tube exploded and died as result of injuries from blast. A/C was participating in a final extraction of FSB Mo. A/C initiated takeoff and while attempting to clear the barriers, A/C had some minor blade strikes on bamboo. A/C then started a left bank to avoid hitting a large, dead tree. Corrective action was late and M/R struck the tree on the right side of A/C. A/C settled tail low on its right side and burst into flames upon striking the ground. IP was performing check ride with pilot approx 2 mi W of Dong Tam airfield. While performing a low-level power off manuever, A/C impacted in a nose low attitude, skidded about 20 ft, hit a 3 ft mud dike and came to rest in rice paddy. A/C began a steep turn to the left, estimated to be 40' when initiated. A/C began to settle and consequently the M/R blades struck the water on the left hand side. A/C pitched forward and rolled right, right front cabin section struck the water and the ship inverted and began disintegrating. Engine failure, autorotation to water, rolled right and sank. A/C had just departed FSB Granite, while climbing and about 700', the engine quit. A MAY DAY call was placed and A/C entered autorotation and landed in the river, rolled right and submerged quickly on its right side. Medevac came under heavy ground fire while attempting to land at FSB Ripcord and MD was killed AK-47 fire and A/C was brought down by RPG. On approach to Co Roc Mountain LZ, A/C received SA fire, then was hit by RPG. Pilot descended down side of mountain while A/C was on fire, flared just before impacting trees. Pilot was killed on impact and others were rescued. A/C was attempting to land near the road where troops were waiting to load onto the acft. A/C was in a steep decelerating flare as it approached the ditch near the road. While still moving forward at about 5-10' above the water in the ditch, A/C suddenly started to level, spun rapidly to the right about 180 degrees and landed abruptly on its left side in 2-3' of water. A/C experienced a loss of power and pilot turned down the ravine to regain RPM. A/C continued to lose power and fall. AC tried to regain control, but it struck the ground, rolled and exploded. Loss of rotor RPM, landed hard and turned on the left side. Shot on LRRP insertion 20km N of An Khe. Shot while inserting LRRPs in an unsecured LZ. Pilot died from injuries received in crash. A/C was escorting a DUSTOFF along with another slick into the mountains north and east of Vo Dat. Weather was marginal and the ships entered IFR. The DUSTOFF and other slick exited the clouds but #182 did not. Hit a mountain near Bao Luc partial IFR flying from Tay Ninh to Cam Ranh to visit troops in hospital. Shot through the side by AK-47 while on short final flying trail in the Nam Cam forest. 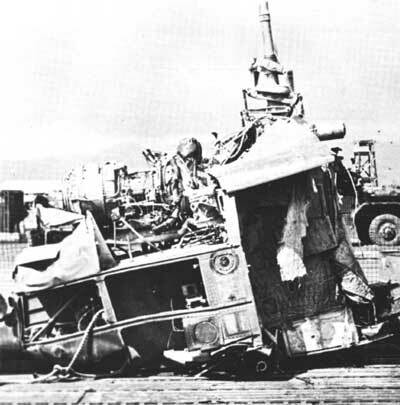 A/C was on a C&C mission when it was hit by enemy fire, crashed and burned near the Cambodia/South Vietnam border. A/C shot down at YU213402. Engine failure shortly after takeoff with resulting crash. Remainder of the crew survived. A/C departed Ca Mau at approx 1800 hours and approx 5 minutes later at an altitude of 1500', the mast apparently snapped off just below the rotor head assy. Suspected mast bumping of M/R head system. A/C fire team was on a recon mission and took fire from a hooch surrounded by tall trees which hindered their angle of attack on a run. Pilot took a steeper angle to get a good shot and was unable to pull out of the dive, hit trees, rolled over, crashed and exploded. A/C went into steep dive and was unable to pull up. The stinger struck and did little to prevent one of the T/R blades from striking a small dike. A/C began coming apart as it went sliding across the rough terrain, hit nose low on mound of dirt, breaking off left skid, landing light, and plexiglass from the chin-bubble. At this point the tailboom separated, as it did the M/R head and blades also separated. A/C began to tumble and caught fire. A/C took 48 hits on ammo resupply mission. Pilot took one AK round through the heart. On a CA mission at LZ Kelly. A/C was Chalk 2 in the flight when an AK47 round entered through the floor, missing the armored seat, collective and the chicken plate and killed pilot. A/C flew into a thunderstorm and crashed. A/C was flying low level to avoid wx and during flight xmsn strap broke while avoiding hostile fire. While attempting emergency landing, A/C struck trees in a nose low attitude and crashed. A/C was shot down on a medevac mission and CE was possibly shot while exiting the aircraft. A/C was shot down and crashed in water. A/C apparently crashed and burned due to bad weather while transporting an airfield inspection team from Loc Ninh back to Saigon. Died when the remnant of a large-caliber round entered his heart. A/C was shot down during a SOG extraction. A/C was on a CA southeast of Can Tho and were inserting ARVN troops on the LZ "right ear" of "Mickey Mouse's Ears" (river bend area resembling cartoon character). While departing the LZ, CE was hit by a single round and died later at the hospital. A/C was hit in the fuel cell area by an RPG, crashed and burned. Flying right seat in C&C near Nui Coto Mtn south of Chilang in Delta, took one .50 cal round through right door and armor. A/C was on takeoff and trying to avoid strand of comm wire strung about 15' above ground. To avoid the wire, pilot lowered collective and decelerated acft into a tail low attitude, which was compounded by a slight downslope, causing stinger and heels of the skids to contact ground and push tail back in the air thereby lowering the nose which then contacted the ground. A/C then pitched up and right in tail high, nose low attitude causing M/R blade to strike the ground, then pitched right on its nose and flipped on its left side coming to rest about 25' S of where skids initially contacted ground. CE was pinned under wreckage. B-40 rocket in cockpit doing a combat assault in Cambodia. Took RPG through the tailboom near Khe San. Engine failure on a Sniffer mission in Cambodia. On approach to POL area at 100-150' and 1/4 mi out, A/C experienced T/R failure, and initiated autorotation. As A/C touched down it hit right skid low and rolled over. Gunner was trapped under the rolling helicopter and was crushed to death. A/C was at 1000' AGL when pilot reduced power and put acft in nose low attitude heading toward the ground. At approx 300' AGL, pilot tried to recover by pulling power but acft failed to respond quickly. Pilot leveled A/C and contacted ground at approx 80 KIAS with considerable downward force, tearing both skids loose and T/R contacting ground. A/C then cartwheeled forward and onto left side causing M/R head and left front doors to tear off, continuing to roll completely over before striking a gulley and coming to a halt and catching fire. Shot down by quad .50 cal 3 miles E of Cai Ba. A/C was Chalk 3 on ARVN insertion. The flight went into LZ 21 times. After dropping off ARVNs, A/C did a hovering 180 deg turn then got hit while at a hover. Pilot killed by one round in the head. A/C crashed during a re-supply mission in the Ripcord area. A/C hit by two B-40 rocket propelled grenades while on a medevac mission. *SP5 Wolfe may have injured on this mission, he died of wounds on 27 JUN 70. Upon landing at LZ, A/C was hit with an RPG. A/C left Tay Ninh with an American advisor and 2 ARVN officers for VR mission in Cambodia. Crash discovered at 1800 hours. M/R struck tailboom 3 times, one time near 42 deg gearbox, one time near sync elevator and third time near tailboom attachment point. M/R mast separation occurred sending acft into near vertical descent, rolled left, struck the ground on left side and bounced to final resting point on left side approx 10m NE of initial impact point. Flight was coming out of an LZ when they started receiving .51 cal fire. A/C received a number of hits and the remainder of the flight climbed into an overcast sky. Pilot started an autorotation and the A/C went inverted just before ground contact. A/C crashed after having hydraulics failure and cyclic hardover south of FSB 411 on MSR near Quang Ngai. As the A/C lifted off from the PZ with 4 crewmen and 9 ARVN troops aboard, it lost engine RPM and fell out of the sky, impacting in a nose-high, right bank attitude. A/C continued in forward motion until it hit an embankment and rolled. 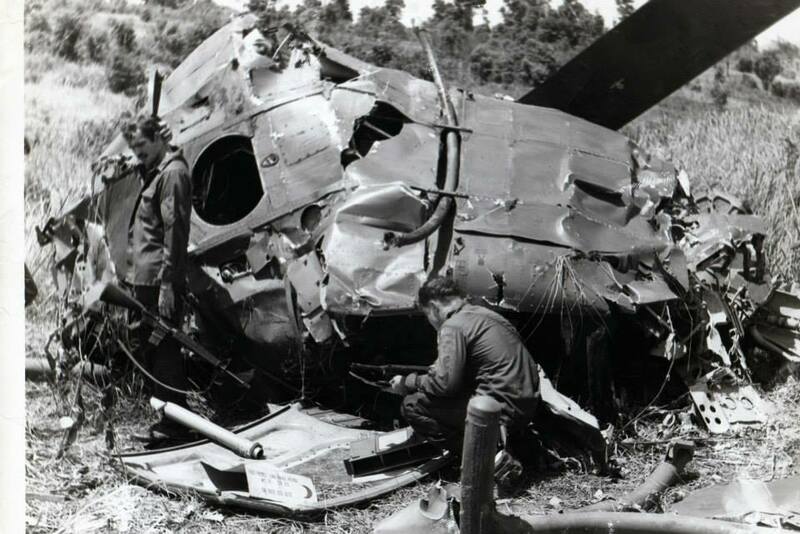 A/C was shot down while on recon of Highway 509 about 10 miles SW of Pleiku. A/C was on resupply mission to ARVN outpost under attack approx 24km W of Kien Long. On approach A/C received light arms fire. Pilot was hit and slumped forward in seat on the flight controls. A crewmember tried to pull him off contorls, but A/C nosed toward the ground and crashed. A/C shot down and crashed into column of D/1-11 soldiers enroute from FSB Fuller to the Khe Gio Bridge. Two soldiers killed in the column were PFC James A. Blackmon and CPL Robert B. Luther. Flying C&C when A/C lost a M/R blade. Thrown blade caused by the hole in the end of the blade for the balancing weight bolt, for this particular lot number blade, had been over drilled by 1/16". A/C crashed and exploded about 5 miles SW of the city of Phy Vinh. Shot down returning to Pleiku from Ple Mei or Du Co.
A/C shot down while on an emergency resupply mission. A/C crashed during a Cambodian mission. Mid-air with UH-1 #66-16707 while laying smoke and crashed. Mid-air with UH-1 #68-15663 while laying smoke and crashed. Died instantly due to a head wound on takeoff from an LZ. *Gunner died 7 days later of injuries. A/C shot down, crashed and burned at Michelin Rubber Plantation during a gun run. Flare malfunction caused fire and during descent had a mid-air with AH-1G #67-15620. A/C crashed and burned after loss of M/R. A/C departed Tay Ninh on a logistics mission to FSB Bruiser. During the flight, A/C encountered a heavy rainstorm, and while trying to locate the FSB in zero visibility caused by the weather conditions, crossed the Cambodian border. It was struck by enemy radar guided .60 caliber AAA gun fire which ignited flammable material in rear of A/C, landed in rice paddy near the city of Memot. Varnado and Young died as POW's. 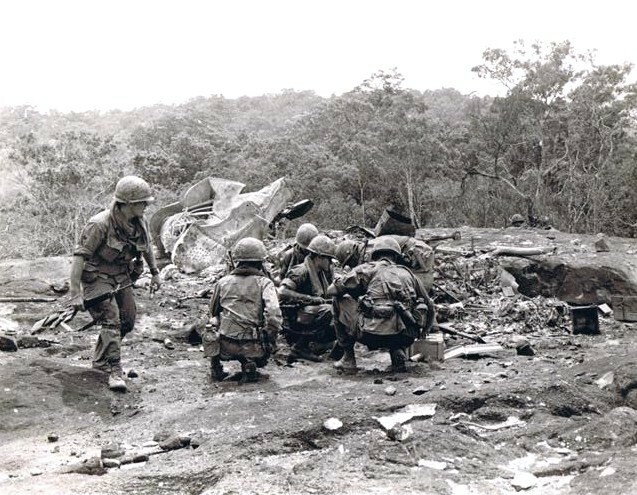 A/C was picking up a wounded 25 INF soldier from an NVA bunker complex near Ham Tam. A/C took numerous .51 cal hits killing MD and PAX. Pilot tried to make it to the surgical hospital with wounded but engine and hydraulics quit causing A/C to crash into trees, rolled and burned well east of Xuan Loc (ZT006062). A/C was returning to Quang Tri on a medevac mission when it crashed into the sea. All survived crash but drowned trying to reach land. A/C shot down by small arms fire near Tuy Hoa on recon mission looking for AA gun site. A/C was working an area SW of Can Tho and was in process of destroying an enemy bunker flying on a SW to NE course line breaking left to disengage. Began rocket attack at approx 400' MSL. A/C fired two rockets that missed high, started second run closer to trees and while turning left, flared in an attempt to gain altitude but hit the trees with fwd airspeed and plunged through the trees in a level attitude for approx 30m, rolling on its left side and burst into flames. A/C crashed during post-maintenance test flight performing an N1 topping check. At approx 1100 hrs, A/C was seen spinning right at approx 1200' AGL and stop spinning at approx 700' AGL. At 400' AGL it began to spin again and crashed in a rubber plantation 8000m SW of Phuoc Vinh. T/R hit a tree during liftoff out of an LZ causing A/C to roll over and crash. A/C shot down south of Dak Seang. Making a resupply/medevac from a hill north of Dak Seang when they came under fire. CE was killed instantly by bullet in the head. A/C caught fire was sat down and burned completely. Hit in cockpit at hover with B-40 on hot LRRP extraction in Cambodia NW of Duc Lap rolled inverted and crashed on nose. A/C was enroute from Pleiku south to Cheo Reo 100' or so above main road in an area that was notoriously a cold area. NVA had setup a .51 cal position just offroad and when A/C passed over, they fired on it from the rear when it was pretty much a stationary target. A/C hit the ground just west of road. A/C was on ground in Dak Seang when a 105 recoilless round hit A/C blowing it up. *Stepp died 41 days later of burns. A/C was on 90-day checkride and was performing hydraulics off landing when they lost rotor RPM, hit trees and ground. A/C bounced and left skid hung on tree stump causing A/C to rotate 215 deg counterclockwise before contacting ground again and burst into flames. Pilot died later of burns received. A/C departed Red Carpet helipad at 1812 hours enroute to Cu Chi Base Camp. While flying at approx 70' AGL, A/C struck two steel cables, the first striking the center of nose cutting the radio compartment cover in half, then sliding up over the roof cutting the UHF antenna and air vents, then into controls of the A/C cutting the fore/aft and lateral cyclic servos. The tension of the mast gave the A/C an excessive nose high attitude at which the M/R blade struck the wire, shattering blade and breaking the wire. The second wire, which was growing taut, pulled A/C into a nose low attitude, broke due to stress from weight and velocity sending A/C nose first into Song Dong Nai River vertically. A/C was the Flare Ship operating around FSB Atkinson. Pilot did an autorotation to the berm of the FSB and ran into upslope with rotor blades. During egress, pilot was struck in the head by M/R blade. A/C was second acft in lift to approach LZ and was hit by ground fire during landing and crashed and burned while inserting ARVNs. A/C departed Moc Hoa airfield and spotted a Sampan, descended to 15-20' above the river. At 90-95 KIAS, the crew turned their heads to the left and the A/C impacted the water and sank in 15-20' of water. CE & Gunner's bodies recovered 2 days later. Killed by enemy ground fire near Phuong Hiep. A/C crashed at speed in a nose-low attitude due to push/pull tubes shot out by ground fire while on sniffer mission west of An Loc. CE was thrown out of A/C and survived with minor injuries. Pilot received a .50 cal through his chicken plate while on ground during routine mission to secure LZ, VC popped up out of spider hole. A/C hit in the cabin by a B-40 rocket, crashed and burned. While on a combat assault, A/C was sitting on ground in the PZ when hit by RPG. Shortly after, A/C rose from the ground uncontrolled, hit on right rear side, then rapidly flipped to final rest on its left. The fuel tanks blew and was completely destroyed, killing CE and all 10 of the ARVN grunts on board. A/C was on a 90-day standardization check ride and was performing a hydraulics failure when the engine failed on downwind leg at approx 600' AGL. Pilot attempted to land on a narrow dirt road but fell short. A/C bounced and rolled left and landed inverted and burst into flames. *IP died later of burns received in crash. Picked up SF team. A/C began its ascent when it was hit by enemy fire, an explosion in the A/C was seen. The A/C continued in flight for about 300 meters, then another explosion occurred causing the A/C to crash in the jungle. Crew remains repatriated on 12 Apr 1995. Single ship hover down LZ-rocky ledge surrounded by jungle. RPG hit left rear crew compartment blowing off tailboom, engine and rotor system. A/C shot down attempting to resupply 101 FB on eastern slope of A Shau Valley. Hit with a single small arms round behind his chicken plate. A/C crashed into the mountains during IFR while on a C&C mission, approx 7 miles west of Chu Lai. A/C struck several trees on a steep hillside while angled slightly upward, broke apart on impact, rolled down the slope, and came to rest inverted. A/C hit by B40 rocket. A/C took a 51 cal. in the chin bubble, which penetrated pilot's thigh and then struck him in the face. At kick out LZ, A/C settled into trees from hover and crashed. 3 minutes after lift-off from the PZ, CHALK 4 radioed an engine failure and was going into the trees. A/C decelerated rapidly and had near-zero forward velocity when the tailboom impacted a tree top, spinning A/C and sending it into trees in nose-low attitude, resulting in an explosion falling to ground. Shot in combat action around the Bac Lu AO. Pilot was killed by enemy fire on an airmobile operation when bullet penetrated flak jacket seam. A/C was lead in flight of four acft moving ARVN troops from Ban Me Thout East to Duc Lap. Flew into tree line in heavy fog while making a left 180 degree turn. Crashed during a CA to a mountaintop LZ, possible T/R failure. Hit by RPG on gun run west of Quan Loi and exploded 3 times before impact. A/C was lead to LZ and was dropping off 8 ARVNs when it began receiving small arms fire. Pilot was hit by a single AK-47 round in his left chest. Crashed into a hill at night after leaving LZ Evans to go to LZ Sally with security element for other 4/77 ARA aircraft. Lost power on CA insertion - rotor blade hit boulders in LZ & whipped thru greenhouse hitting pilot in head breaking neck. A/C was flying a combat aviation mission near Khanh Hoa when he was critically wounded. While flying light ship, hit by B-40 rocket and exploded in the air. Trail ship on a graduation exercise insert for the ARVN ranger training group at Nha Trang. Found bullet holes in tailboom. A/C was accompanying gunships on a last light recon south of Can Tho near Phung Hiep and was orbiting at 1500' when pilot was struck in the head by enemy ground fire. A/C received hostile fire and gunner was killed. A/C was flying 10-15' above river when it impacted and immediately sank. A/C was extracting Blues and received heavy SA fire on liftoff and experienced rotor difficulties and crashed. Shot down while supplying ammo to troops in Cambodia. A/C crashed at approx 1110 hours due to transmission seizure in Quang Nghai area. A/C lost T/R on sniffer mission, crashed into a mountain SW of Nha Trang and burned. Gunner was shot and fell out into LZ Challenge. *He died on 12DEC72 of abdomen and spinal cord wounds. A/C was lead on a two-ship movement of troops from one location to another. Killed by enemy fire, head wound while inserting troops in a hot LZ. Hit by friendly fire from bunker line at green line. A/C departed Ky Ha helipad at approx 0815 hours on courier run to DaNang. A/C was flying low level approx 100-300' and 80 KIAS when it experienced a T/R malfunction. Airspeed dissipated and nose began to tuck under and began a spin to right. A/C then experienced an extreme nose high attitude, M/R hub and blades separated and severed tailboom, fuselage rolled left and contacted the ground inverted, and fire resulted. A full pod of 2.75 in rockets was inadvertently fired into the revetment wall while the A/C was undergoing daily maintenance. Leshen was standing behind the rocket pod when they went off and he died from the extensive burns received. Accident occurred during a resupply mission in support of A/326 ENG BN. A/C had been unloaded of its cargo of wood planking on the log pad. AC brought the acft to a hover and after being cleared, began a slow left pedal turn in order to be in the most favorable takeoff position. As A/C completed approx 10 deg of a 90 deg left turn, it began to roll to right. AC countered this force by applying gradual and finally full left cyclic, with no apparent effect. Pilot began to lower collective in an attempt to land, and A/C shuddered as the advancing right blade struck the ground, rolled onto its' top right side and began to burn. The 2 pilots and CE evacuated, but the gunner had been pinned under the wreckage. Ground personnel tried to free the trapped gunner, but the intense heat made rescue impossible. A/C was on a support mission for MACV Team 42. A/C was traveling at 200-300' AGL when witnesses noticed the nose pitch up and then made a descending left turn. Smoke or fire was coming from cowling below the swashplate. A/C descended with excessive fwd airspeed, struck the ground, right skid first. After impact it traveled approx 25' before hitting a 2x2' dike. then traveled 25' where it struck a 4' bank and burst into flames. A/C began coming apart and rotor assy separated. A/C traveled approx 110' in the air before impacting again, tumbled 90' where it came to rest and burned. On a medevac mission, A/C arrived and entered a left hand orbit and came to a 200-300' hover w/search light on. After 10-15 seconds of hovering, A/C began to accelerate as though he had decided to attempt another pass. A/C passed to the south of the church (PZ) and entered a steep left turn. A/C then appeared on the north side of church in a descending steep left bank which continued until ground contact against a hillside below the ground level of church. A/C impacted in a nose-low approx 80 degree left bank. A/C was on maintenance mission from Hue to Phu Bai. When the A/C was about 18 mi NW of Hue City, caught fire and crashed, due to a malfunction. After an explosion from within the ship, control was lost and the A/C turned over on its right side. A/C hit by an RPG while landing in a hot LZ during air assault mission. A/C shot down, crashed and burned. A/C was hit in the left side causing an explosion. Killed when a booby trapped enemy ammunition container exploded within the A/C. A/C shot down. No further details. A/C was assisting a Dustoff mission when bad weather was encountered and acft turned back. They attempted again with #151 leading. Pilot approached ridge line at a high airspeed, trying to make it over ridge before weather closed in. A/C went IFR at approx 1445 hours and attempted to climb out and pick up Phu Cat AB for GCA. At 1448 hours, trail ship tried to contact lead with negative results. A/C wreckage was found 2 days later. A/C was flight lead in a flight of 3 returning from Tien Phuoc to the unit base at Chu Lai. 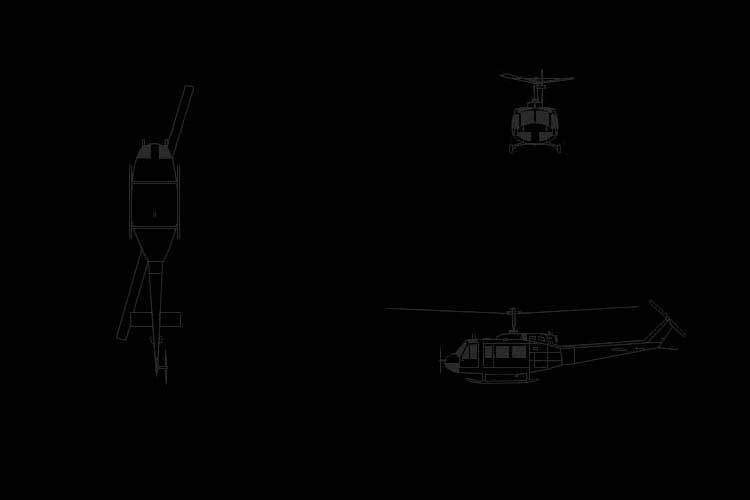 Due to IFR, helicopters changed frequencies to contact Chu Lai approach control, radio contact was lost with A/C and was not regained. 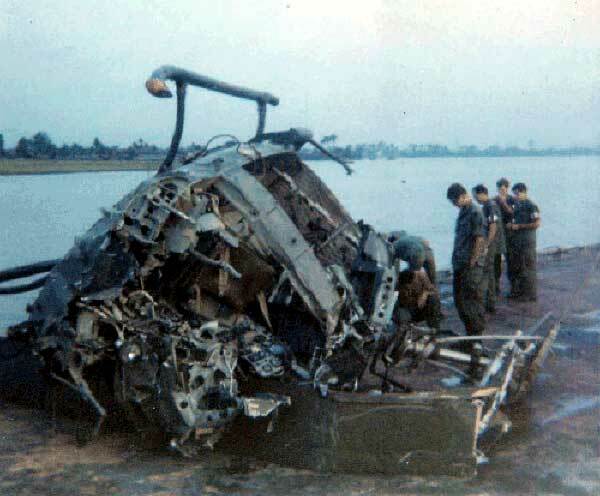 A/C shot down and crashed in the Mekong River. A/C was providing cover for a defoliation mission along a canal near an ARVN compound west of Vinh Long, when pilot was hit in the throat by a round. He died before the crew could get medical help. Rotor separation on a maintenance test flight south of Vinh Long Airfield. A/C was conducting a "Nighthawk" night operation, testing the INFANT system. A/C entered a gun run from approx 1000'. Wingman watched as A/C leveled off at about 300' before entering a high-speed descent ending with ground impact, exploding and burning.